SALT LAKE CITY – Sen. Orrin Hatch announced Friday the nominations of 31 Utahns to the military service academies for this year. These young men and women are from throughout Utah and have been nominated to one or more of our nation’s service academies: the Air Force Academy, the Naval Academy, the Military Academy at West Point, and the Merchant Marine Academy. From St. George, Cody Perry is nominated for the Naval Academy, Bridgette Maloney for West Point, Merchant Marine, and Zachary Miller to West Point. 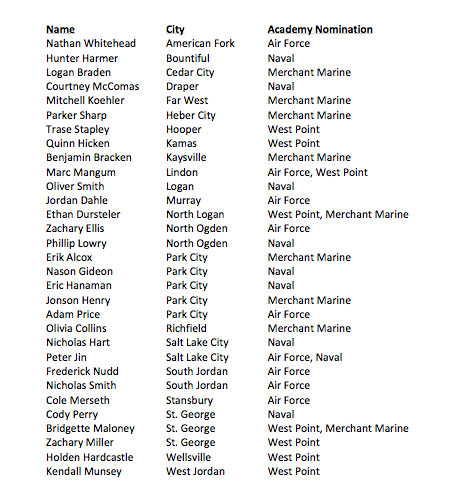 From Cedar City, Logan Braden is nominated to the Merchant Marine. Selection criteria include interviews, SAT/ACT scores, class rank, GPA, school records, evaluations by teachers and counselors and participation in extracurricular and athletic activities. After Hatch submits the nominees to each academy, the schools then select the candidates of their choice. The nomination is an important first step in the process. The following are individuals who have received a nomination from Senator Hatch. The information includes the academy/academies they have been nominated for and their home town.